A while back, I reviewed this cookbook and realize it's just been gathering dust on my shelf. I don't have the time to create purees, and I prefer my kids just enjoy vegetables looking like vegetables. That doesn't mean somebody else wouldn't use and love it! So, I decided to give it away! 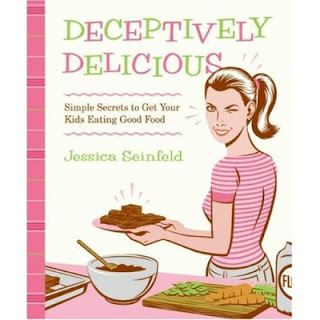 I have an almost-new copy of Jessica Seinfeld's cookbook, Deceptively Delicious to give away to one of my readers! I'll randomly choose a comment and send the book on its way to you! That's all there is to it! ETA: Kelly was the winner of this giveaway! Comments on this post are now closed! I have read so much about this book and would love to try the recipes in it on my picky 4 year old and 2 year old! :) My favorie veggie right now is corn on the cob! Thank you for the giveaway! I just followed you over from WantNot. And, just in time, I see. :-) I, unfortunately, have Prince and Princess Picky in my house. We've been joking about liquifying beans to hide in our daughter's juice. My favorite vegetable at the moment - cucumbers. My dad just brought a batch from his garden. Yum. Thanks for the book offer! Currently, we are all loving yellow squash cooked in a little butter and garlic and lightly salted. Yummy! Oh, and sweet corn from the farmer's market. On a side note, I read another book like this one (but it came out a few months before), called The Sneaky Chef, who also uses purees. This author said that if you do not have time to make the purees yourself, you can use Beechnut baby food instead. I believe she suggests that brand because its uses no fillers and other yuckies. Anyway, if you don't have time to make purees, you could use this idea instead and still get the benefit without the work of making it all yourself. I have heard about this book and would just love to try out some of the recipes. I do have picky eaters at home and this would really help me out. I love broccoli - because my 3yo and 5yo will eat it by the pound - I have to fight them not to steal mine off my plate after they scarf theirs down LOL! Asparagus is yummy, Brocoli is too, but Lola's favorite is Spinach and not one of her family memebers shares the love of it oh pooh. I have 3 cookbooks, Two slow-cooker and one Betty Crocker RedBook. This one just might help the darlings try something other than Carrots and Brocoli.